Al Newman, Sr., a retired carpenter, traded in his hammer for a paintbrush. The artist has painted on buffalo hides and metal, but his most recent work is a straightforward oil on canvas. 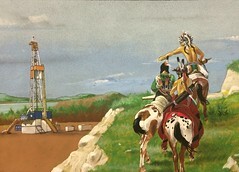 It shows three Native men on horseback pointing at an oil derrick. He’s titled the painting, which hangs in the Three Affiliated Tribes council chambers, “Past and Present.” Newman lives near Mandaree, North Dakota.